Our exclusive product. 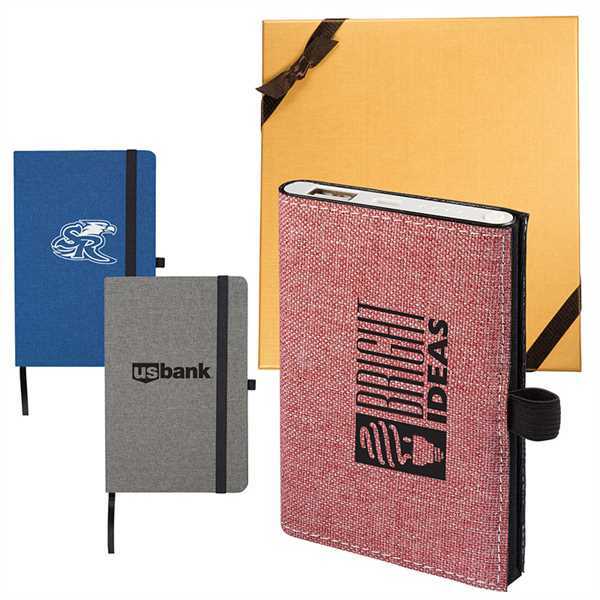 Gift set includes one piece of our STRAND™ Snow Canvas Journal and one piece of our STRAND™ Slim Executive Charger. Bound Journal features 300D strand snow canvas polyester cover and black elastic band, inlcudes 80 white lined sheet and a black elastic pen loop (pen sold separately). Slim aluminum power bank emergency battery charger features a snow canvas accent wrap body, and LED indicator light. Power /Technology: Input DC 5V/1000mA; Output DC 5V/2100 mA. Rechargeable Polymer battery. Capacity: 4000 mAh. Charge time differs by device. Must charge power bank prior to first use. Includes USB charging cable. CE, RoHS and FCC approved. UL Certified. Charger fabric is a darker shade of blue than the blue notebook. Size: 8 " x 8.5 " x 1.625 "